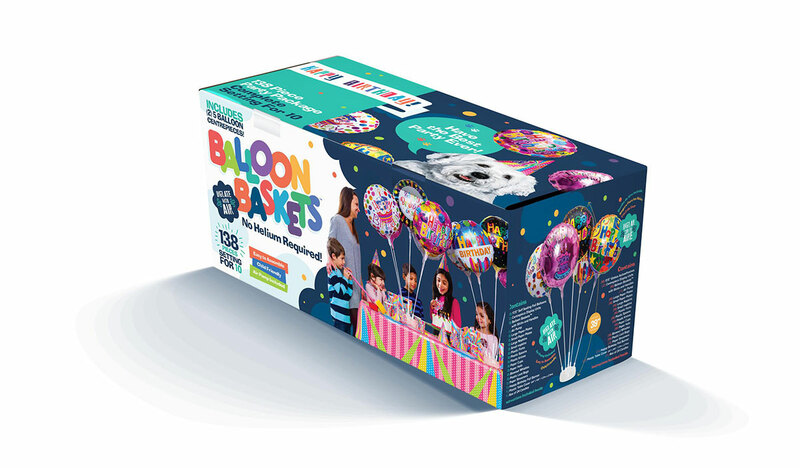 Balloon Baskets offers helium-free balloon kits, party kits, party favors and decorations. These kits are child-friendly and designed to bring life to your next party. These decorative kits have a crafty DIY style to them, and provide a fun and original way to decorate your next party or event. Balloon Baskets specializes in helium-free balloon kits and decorative party favors, this DIY-inspired kit brings party favors to a whole new level. Before Balloon Baskets came to us, they lacked an engaging package design, a logo design, proper branding strategies and collateral. The goal of Cary Povitz, the founder was to create a re-usable balloon kit that could help save money or be used as gifts at the end of an event. The patented Basket created allows the customers to fill, deflate and refill again for constant reuse. Since this was a novel idea, the packaging had to be fun, but also educational, allowing the customer to quickly understand the benefits of buying the product. We were able to create an entire brand presence for this company. It began with a fun and easily readable logo that would serve as the brand's face. Many engaging package designs we developed to showcase the different package shapes and sizes the product could come in. Along side that we created fun instructional guides to allow the customers to easily understand it's use. Tangible evidence was created through brand collateral for Balloon Baskets which serves to promote the brand and enhance sales and marketing. The combined work resulted in brand collateral designed congruent with the brands core values and personality. A logo design which was created as a visual identity for the brand, used to allow people to easily recognize the brand and their purpose. Through package design we created the visual outer presence for the brand. Through the use of branding and design, Balloon Baskets gained a great amount of recognition and an all-around visual representation for their company. The company is finalizing it's placement in large box retailers such as Costco, Target, Walmart and many others.